You will be able to find excellent restaurants in Cape Town, coffee shops and bars to cater for any taste. Are you a seafood lover or meat eater, a vegetarian or do you love savoury dishes or have you got more of a sweet tooth? I am sure your tummy will be filled with delicious yummy Cape specialties when dining out in the Mother City. There are places for the more adventurous eaters like Africa café, where you can taste crocodile or kudu, as well as there are the traditional Italian places where you can find excellent Spaghetti Bolognaise and Pizzas. As in any metropolis around the world there are also the standard fast-food outlets as McDonalds and Kentucky Fried Chicken and their South African equivalents Wimpy and Nandos with their signature peri-peri chicken dishes. Did you know that Wimpy is an all time favorite of South Africans and the Mother City’s oldest fast food chain? Love your daily Coffee, Espresso, Latte macchiato? The Mugg & Bean chain coffee shops are the South African equivalent to Starbucks and you can find them in almost every shopping center. Coffee shops and bars are still quite new in Cape Town, but you can find more and more of the European style coffee shops like the Portuguese Vida Coffee Bars, where trained baristas work on your order to get you the best coffee latte (milk coffee) or espresso. Especially if you like seafood, you might feel you are in paradise in Cape Town. There are plenty of places where you can indulge in the freshest of fish and creative preparation. There are many places offering line fish (fish of the day) prepared as the chefs specialty. A must try is the snoek and also the kingklip which are real South African specialties . As sushi (Japanese fresh fish roles) is also very popular now in Cape Town there are many excellent restaurants offering the raw fish experience. Meat lover? Care for a delicious steak? For a long time the main aspect was freshly hunted game in any variation, cooked in stew, grilled at big family get-together namely braais (which means barbeque, Barbie or BBQ) or dried and cured or smoked as in “biltong”. You will find traditional style cooking with meat and sauces especially in Cape Town’s steak houses. The Spur Steakhouses are very popular here and you will find them across town. This is a popular restaurant also with families with young children, as they have pencils and drawing paper as well as playgrounds at their premises. For lovers of delicate carpaccio: In Cape Town you will be served great kudu, springbok or ostrich carpaccio. These are definitely on the specialty menus of many of the upmarket restaurants in town. ExpatCapeTown Advice: South Africans like loads of sauce on their plate, so be sure to hint that a bit on your meat is fine. One specialty is Monkey gland sauce which is sticky and sweet, but sooo delicious. Have a try! Also Vegetarians will not be disappointed by the choice of restaurants in Cape Town catering for their taste. There are vegan bistros and vegetarian restaurants where you can taste the many colorful creations of the Cape Town chefs using the freshest fruit and vegetables available on the daily market. If you are on a restricted diet you will find that Cape Town will cater for your needs too. If you are looking for info on special dietary requirements please go to my special page here. Ever wanted to have the most splendid view of Cape Town and enjoying a delicious buffet style lunch or dinner? Then you have to go on a harbour cruise with The Sea Horse. Watch the seallions in the harbour and enjoy a splendid sunset or leisurely cruise through this working harbour and try to stop yourself from eating too much, as this food here is most delicious. They offer a great dining experience with lovingly prepared buffet food which includes mussels and crayfish as well as chicken and curry dishes. The Sea Horse leaves from the V&A Waterfront every lunch time and for dinner cruises. Your expats tastes are well catered for too, you will really feel at home in the some of the Mother Cities specialty restaurants and eateries, where you can find international cuisine, like Vietnamese specialties, Thai, Indian or German delicacies. Because Cape Town is so popular with overseas tourists and has got such a big expatriate community, you can find Laksa as well as Weisswurst, Thai Green Curry as well as Roti Prata and Butter Chicken. 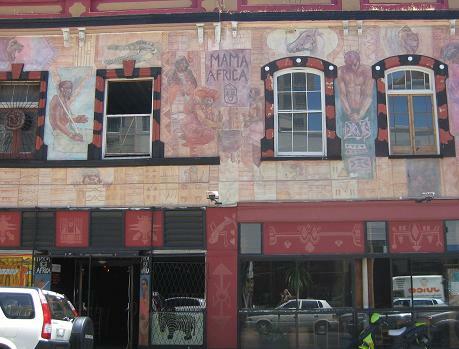 Many star and crown rated restaurants can be found in the Mother City, some of them offering fusion style cooking, meaning they offer local specialties combined with exotic or foreign creations. Some of the most famous star rated restaurant will be found at the four and five star hotels in the city like the Cape Grace Hotel, the Mount Nelson, the Table Bay Hotel and the Winchester Mansions, just to name a few. If you are looking for some special restaurants in Cape Town then please send me a line with my contact form below. I will try to help you to locate this restaurant or special food in Cape Town. Should you want to share a tip for a great restaurant you are very welcome to tell me, so I will add your special place too. Thanks for visiting and hope you enjoy the splendid food in the numerous wonderful restaurants in Cape Town.